Watch the 3 NEWS item. 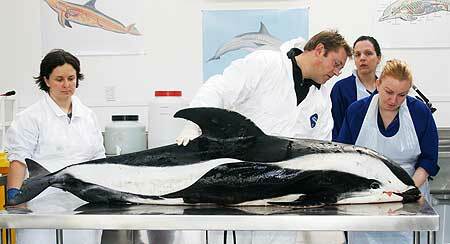 Marine ecology lecturer Dr Karen Stockin, who headed the post-mortem, says the carcass is thought to be only the second in 150 years to be stranded on the New Zealand coast. The 1.7m, 78kg male was found dead at Flea Bay near Akaroa on Sunday, September 5. "Having access to this carcass is incredibly exciting for us as so little is known about these animals, their diet and biology," Dr Stockin says. "This is a once-in-a-lifetime opportunity for us to collect detailed data and to add significantly to the scant knowledge of this species." Hourglass dolphins, also known as the skunk dolphin, Wilson's dolphin and Southern white-sided dolphin, are easily distinguished by their unique white "hourglass" marking along the length of their mostly black bodies. Findings of the post-mortem and of a CT scan will be written up for publication, Dr Stockin says.